During my prayer time today, I saw two very short visions that might indicate a big drop in housing prices coming soon. In the first one, I saw a giant mound of dirt, about 100 feet high. On top of the mound was an unfinished house positioned at the top of the mound, right on the edge of the dirt cliff, which was right in front of me. The house was covered with the black paper-like material that builders apply prior to adding the final outside materials, such as bricks or siding. The roof was flat, not like a normal house. On top of the roof was a big sack of more of the same dirt. Suddenly, the house slid off the edge and went into a freefall. It remained upright until it hit the ground, which was also made of dirt. As it hit, it collapsed forward a little, again right in front of me. The sack of dirt that was on the roof fell onto the ground and split open, which caused the dirt from the sack to pour out all over the ground. Since it was an unfinished house, I believe it represented the housing construction market. After the collapse of the housing market in 2008, it was propped up by the Federal Reserve Bank making large purchases of mortgage backed securities. The impact of that crash was so large, it nearly took down the entire financial system. It impacted the housing construction market in nearly every developed nation in the world. The damage would have been much worse if not for the government bail-outs. However, nearly all developed nations are in much greater debt now than in 2008, so bail outs would be much harder to pull off this time. I believe the ground represents the support level where housing prices will land very hard and very fast. The black color also reminded me of previous market crashes, which have been referred to as black to represent major drops, such as Black Monday and Black Tuesday. My second vision was even shorter. I saw an upside down roof of a house falling straight down and crashing onto the ground. As it crashed, white dust went everywhere. It happened so fast I did not see where the dust came from or if there was any on the ground before the crash. Since it was the roof of a house, it might be the missing roof from the previous vision. An upside down roof could refer to homeowners being upside down on their mortgages due the drop in the value of their homes. An alternative interpretation is a sharp drop in the price of silver because of the white dust that went everywhere (silver is called the white metal). Whether it refers to housing or silver, the roof could also represent the upper resistance level that has kept prices from moving any higher. I believe the resistance level is going to drop down very fast and crash into a firm support level. “Below are just some thoughts, not firm conclusions. I believe these are market dreams. The concept of “house” is not fully clear. I like the reference to the past as a possible interpretation for the future. In the past, the market crashed because of mortgages, thus housing was the main asset class that tripped the crash into everything else. The next crash may have a different cause, but the result is the same. Asset prices will drop. The market “house” is built upon a mountain of dirt (debt), just like 2008. The house is incomplete in the sense that we’ve not rebuilt our economy, including the literal housing portion. I like your idea of “black” being an indicator of a Black day. I think that fits the context pretty well. The market “house” falls down the mound of debt because that mountain cannot sustain the asset prices. The dirt on the roof also falls down, which could be something like derivatives that rest upon the asset structure of the market. The “house” is like security for the roof “dirt” (derivative claims) and since the house falls, the underlying value of the contingent (and leveraged) claims must fall as well. So, the mountain is like core debt in the economy and the dirt on the roof is like specific instruments, like credit default swaps, that rest upon the asset price of the “house”. This is not a recommendation for homeowners to sell their homes, but it could be a warning to seek God for further confirmation and direction about how to prepare for a potential sharp drop in home prices. Glad this post came up because it’s been in my mind and prayers. Especially everyone’s interpretation that “white” refers to silver. 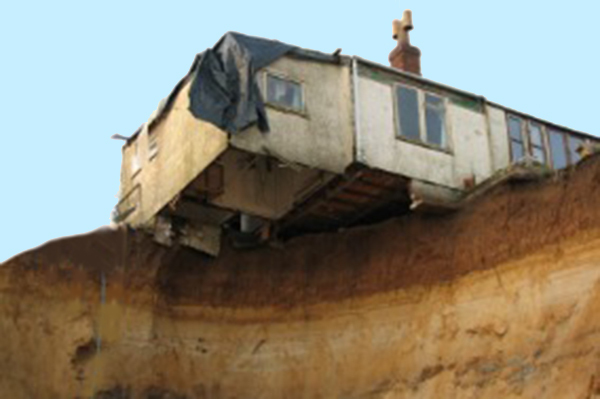 First, when the market implodes and all “leveraged” assets fall, homes will drop like a rock. Silver and gold ARE NOT leveraged assets and represent THE ONLY safe haven. Safer than FAZ and UVXY. I called the ’07 real estate crash and expect another to follow soon. When this occurs (unlike prognosticators on this site) you will again be able to buy a house for a bag of silver (like 1980). Please explain to me again why a “white” colored yacht denotes bearish silver. A yacht represents wealth. James, I have to ask you, why give so much credence to something that is not scripturally based, not fundamentally(economically) based, and against what the rest of the world perceives as value (silver). I believe you make a huge mistake in that. Dreams aside, silver/gold will have more value than FAZ and UVXY combined in the VERY near future. Each of us has to follow the leading of the Holy Spirit to the best of our ability. God can use other people to confirm what He is already showing us, but it is a mistake to make our decisions based only on what He is showing someone else when we have not received any leading directly from Him. That is why I repeatedly encourage everyone to seek God for themselves to find out what He wants them to do. As for me, I am very happy with where He is leading me and showing me to do. I’m at peace where He is leading me. Can you tell me how a white yacht would be bearish to you ? To paraphrase….. in the last days your old men will see visions, your young men dream dreams. I except that as the word of God. What I don’t except is the multitude of dreams about skunks, golf carts, boats, water, ect, a nauseum as being from God. This is not what was intended in scripture. Nor does God desire us to spend our time dissecting every twist and turn of these dreams when we could be otherwise dwelling on Him. I believe this is a reason for the losses here. I also believe it’s the reason Z3 is suffering financially. I don’t say these words lightly as I don’t enjoy being the “bad guy”. J. So, you are essentially saying that JB, JM, Phanuel, myself, and all the people on this site that are beginning to dream about the market are all deceived. That God Doesn’t Do This (see section in my book by this title). That’s rather bold, to specify what God does and doesn’t do in the context of experiences by many people that say otherwise. You are judging this experience from the outside looking in, which is why it is unfamiliar to you. You say that this is somehow separate from knowing God. Please read Chapter 2 of the Handbook to see my thoughts and experience on that. I go to some detail to refute that whole line of thinking. I know you have no faith for this, and you seem particularly disturbed about prophetic conversations around gold and silver. I have no idea why that seems so important to you. Are they really “the only safe haven?” (Ps. 91) I hope not. I certainly don’t think of them that way. They’re just natural tools among many tools. You are clearly offended at this ministry. Offense at the unfamiliar works of God is not new. It happens all the time. So, you don’t get it and that’s fine. So, you should stay away from this–but recognize you’re not speaking for God when you oppose what is happening here. Seems he piqued your offense. As I was reading your comments I kept wondering “why does Jeff read this site if he believes it is so far off base?” ( I have often wondered that about other people too.) I know for me, I don’t waste my time on sites that I believe are leading me astray. Seems like you have experience/knowledge about financial markets so I would think that you have more “credible” sites that you read (and maybe contribute to?) . I don’t always understand some of the interpretations that people have but I know who does….Jesus. So I take what I read and ask the Lord about it. Please know that I am not trying to be confrontational but am really curious about your motivation to read a site that you find so many issues with? Have a blessed day Jeff! Well, Kathy, I can only give you my perspective of coming to this site, while being vary skeptical of “market dreams and interpretations” MYSELF. There are many great writers and faithful children of our Lord that post content and comments to this site that are NOT market focused. I’m interested in all prophetic messages, but the bible tells me to discern and validate, and I just happen to be skeptical to believe that 100% of the market dreams and visions are either from the Lord or are accurately interpreted from the dozen or so writers and regular commenters that participate. Is it just me (and maybe Jeff) that thinks that the potential for deception is high here? Especially with a profit motive easily high-jacked and the potential lo$$es could ruin lives? So I really hope that everyone actually trading in this market bases on dream interpretation is truly getting the “support” from our Lord and profits handsomely. But is anybody keeping score? Weren’t we supposed to see a market meltdown back in late April? So were those dreams deceptive or was the interpretation wrong? So are we now going to say (and I’ve read it here too) “keep the faith, the markets will turn in our favor soon”? ….while folks invest in leveraged ETFs that have a decay factor and depending on when they bought, could be really underwater on the value of their shares or share options. Call me skeptical on the market stuff, but I really enjoy and appreciate the other non-market prophetic dreams and otherwise good sound biblical teachings. And since I know the precious metal market quite well, I try to contribute value where and when I can. The prophetic word for Nisan 17, which was April 25, was fulfilled just as I documented in several previous posts. The word, which was received by Phanuel, indicated the markets would be in a sea of red on Nisan 17 and they were from the opening bell to the closing bell. It was also identified as a day of new beginnings, which I also believe was fulfilled and was also confirmed by a similar prophetic word from Chuck Pierce. When Phanuel originally shared his word with me regarding Nisan 17, I made the mistake of assuming the markets would continue to be in a sea of red after that, but his prophetic word never said that. We have to be careful to separate the details of what God revealed from our own assumptions about what He meant. This is an ongoing learning process. The Bible is filled with examples of all sorts of dreams with all sorts of symbolism, so your claim is not supported by scripture. Regarding your other statement about losses, it is by faith and patience that we inherit the promises of God (Hebrews 6:12). It is a sifting process, a narrow gate, which many fail to enter due to their lack of faith or patience. There is a lot to learn about hearing from God, but it is a big mistake to give up just because we don’t ace every test. Regarding the financial status of Z3, it is not wise to make public accusations about things you know nothing about. The dreams and symbolism within scripture are just that: within scripture. It seems natural to cast a skeptical eye toward those that are not. I believe Joel’s prophecy is for the very end-time, when Antichrist has arrived. Respectfully, I understand that not everyone agrees with my interpretation. Jeff, I sometimes too wonder where the line is between interpreting a genuine prophetic dream and divination/occult. At times I am disturbed by certain posts here. Sometimes it seems they are too close to “tea leaf readings”, etc. I am a semi long term buy and hold investor deep deep deep in the red, and the posts don’t help me anyway. I am certain there are several genuine posters here to whom I am grateful for sharing their insight, knowledge and guidance. They give their time and expose themselves to ridicule based on faith with no material gain. I don’t consider myself in the same playing field as many who post on Z3…I’m just hanging around to, as Steven Curtis Chapman put it many years ago, ‘When you walk with the wise, you will grow wise’! Maybe I am one who “just wants to fit in”, but I don’t beat myself up over that! I am just So grateful to Aba for bringing me here. I actually find it is relatively easy to judge the character of those who post. I believe Holy Spirit is very faithful when you ask for a gift of discernment, He will give it and I regularly thank God that He is my shield and rampart …. He is my protector so I don’t need to fear! I am not pointing fingers at anyone, but caution fellow readers to be very vigilant. Let me give another example. I have heard of rumors that many secret society members essentially sell their soul at satanic rituals for prosperity, including making big money on the stock market. Same goes for fame, political success, etc. And for a time they are given what they bargain for. But their success only lasts for a time, and comes at a GREAT cost in the end. There are interviews on Youtube of ex-members claiming this. I already answered that in my previous reply and in my previous posts. No one is obligated to believe or to follow what I am doing. Yes. This is why we have to learn to discern with the Holy Spirit and the Word; James and others keep pointing this out as the essential key. A lot of posters don’t like the market content on this site, and cite shorter term losses by some as proof of some kind of deception going on. Read beyond that shallow perception and you will see people growing in faith and learning to hear and obey God. Some also deride those participating in these discussions, as people who want to get rich quick etc. Have you considered that some of us need to make some extraordinary gains to be able to afford to be prepared for what is coming, or relocate? Or maybe simply fund missionary work? Please, brothers and sisters, consider that the Body of Christ has many parts, and some of those parts deal in financial matters. Gold going to 700 or less, silver under 10 before the bottom is in. will take time. The deflation will spare no assets. anytime one becomes 100% convinced of a trade, to the point of rejecting any other possibility, they are probably wrong, notwithstanding revelation. time will tell. Historically central banks have always opted for devaluation vs gold as the means of escape from excessive debt and asset price deflation. This was true after WW1, Great Depression, WW2 and the end of Bretton Woods. These periods were frequently preceded by asset price deflation first just as we experienced in 2008/2009, we are now in the period of devaluation. The devaluation response to the pain of 2008/2009 (zirp, nirp and QE) is well established now and we won’t be getting off that train until the central banks have succeed in devaluing currency and debts. There is zero incentive for them to change the policy response of the last 100 years and suddenly reverse course and allow massive defaults and deflation to take hold. Good morning Julz, the only reason i mentioned gold/silver is because right or wrong, there is a sound school of thought that suggest the metals will crash with everything else, it’s called “all the same market.” you can study the theory, see Bob Prechter. That does not negate the real possibility that metals will rocket up, in the future, but only after the deflation cycle is ending. In a nutshell, the pumping in will not keep pace with the rate of deflation, in other words, we are deflating faster than they can reflate. I felt compelled to place this view in the system, right or wrong, because sometimes i feel folks get too married to the gold arguments, they could be right, but they need to be informed that other smart people with good intentions see it different. True and it’s all in the hands of central bankers ultimately, if they respond fast to a crash with QE or helicopter money the gold bulls will be correct, if they allow a solid bout of deleveraging and deflation to occur before hitting that panic button everything could go down first. My observation to date however is that central banks have increasingly little tolerance for allowing things to escalate and will prime those pumps at the first signs of real trouble. Jeff, please, first, do your homework on “money.” (Let me give you a hint: 3700). I’m not saying that I agree with the authenticity of anyone’s dreams or their interpretations as being of divinity, but, some things are simple, and this is one of them. Second, understand that, as of now, prices are controlled by earthly factions (-cough- ESF -cough-). The value of elements assigned by God is not the monetary value that they enjoy now, in this world, and while this world continues on, that mis-assignment of value may continue. God knows. We don’t. Please don’t interpret my comment here as discouragement against owning metal; I believe that white metal is God’s true money. I am wondering would it be safe to buy gold and silver now? and if so where would I be able to get some from? I would encourage everyone to be safe. I have no interest in this retailer or this mint, but I have had good experiences with both. The purchase itself would be safe, but whether it or is not prudent, is anyone’s guess. Hi Ali, in my opinion now is the time to buy gold and silver before there is some big “event” that makes it more scarce. I’ve bought it when the price was high and when it was low. I was buying silver in the run up to $49 in 2011 and I don’t regret it. I am more biased towards silver as that has the greater potential for increase percentage wise however I believe it’s good to have gold as well. You can buy from a local coin dealer, APMEX, Provident Metals and others as well. I like the idea of buying from Kingdom Talents though I have not done that yet. Most of the bigger name pm dealers are reputable. So when buying silver and gold..does the price matter or what the silver/gold looks like? My guess is the housing market crash. James, a week or so ago you talked about a short fall of silver. Silver went from 21.00 to about 19.25. That dream/vision seems to have come and, maybe, now passed. We all know that gold and silver will soon rise. More than likely as we get closer and closer to the October 2 D-date when China’s dollar is part of the SDR. In my layman’s opinion, the drop of the housing prices will allow those that are awake to “get out of dodge” before the SHTF scenario. Now, I do not have any prophetic insight on this, but I would assume the Lord will do this so those who are awake can move to a safer place. This would definitely be beneficial for those who live in the cities. I agree, a few months ago, I know God has told me to sell my house. I believe housing prices will soon drop dramatically, and people will be upside down on their mortgages. The Lord even showed me what city to move to, that it will be a place of refuge in the future. God bless. Brother, please tell me where you will move. My wife and I are researching where to move. Hi David, He has shown us to move to Kerrville, Tx. (Texas Hill Country). We currently live about 45 minutes North of Houston, but, the Lord showed me, my wife and my son, the the Gulf coast will be destroyed by great flooding. God bless. Thank you, brother! I had a possible job opportunity come up a few months ago. It was in Houston. My spirit had a bad feeling about it and I did not interview. I would stay away from all coastlines and all major fault lines, and all the big cities in the U.S. God has given me dreams of large cities on fire, and great flooding on coastlines, possibly tsunami’s. Our only real protection will be the Lord, abiding under the shadow of the Almighty God. We were also prompted by the Lord to sell our rental property recently, which sold early this month. The property had been rented for 6 years, and needed a lot of repairs (est. about $30K) that the tenants had not told us about. The Lord also prompted me to sell it at auction, which brought in a very good price, given the condition of the property. We consider this recent successful sale as a miracle from the Lord. James’ message appears to be timely and spot on. Hello all, after reading the comments I felt needed to comment myself. I am not someone who knows much about markets of any kind. I am not in the markets and as of right now I don’t feel any reason from God to enter them. Now with that being said, I have read and continue to read every post on Z3. Even if it talks about things I don’t fully understand. I was lead to this site by the Lord and have been amazed at some of the prophecies I’ve read. At first it was hard to fathom some of the things I read due to my own ignorance, but with prayer and faith I believe this site is a blessing from our Lord, wether we understand all the posts or not we learn a lot about the grace of Jesus Christ. I have learned that where there is more than one worshiping him he is with them, I have learned that when we all get together and put our faith together we understand more of how the word in the bible physically and spiritually works. While on this earth we all might never truly understand the way the Lord works but with faith and obedience I believe we will have better understanding of why and how his plans came to fruition. At the end of the day it’s all about how we worshipped and loved him bringing as many souls to heaven as we could for our righteous God. An alternative interpretation is a sharp drop in the price of silver because of the white dust that went everywhere (silver is called the white metal). That’s always a possibility and the record number of shorts held by the bullion banks sure let’s us know their intentions (lower silver prices), but that hasn’t worked out so well lately. This week, with the FOMC release, options expiration yesterday, and “first notice day” on Friday, both gold and silver have held up quite well. That’s what the charts show on this latest pullback. August is a major “delivery month” for gold, so most of the biggest action is on the comex gold contracts, so the next few days will be interesting. September comex silver contracts is the big month for silver with the most open interest (outside of December), so there could be quite a bit more volatility next month for silver contracts. But for 2016, both metals have show great strength in climbing this “wall of worry” and the big attacks/raids on the COMEX exchange has not generated any significant or prolonged down swings like what occurred in the past 5 year bear market in metals. What everyone forgets is we ALREADY had the gold correction. It lasted 4 years. So when the market falls and the bond market falls what is left ? Guess what goes up on every market down day today ? When the market collapses the big money will be all over gold/silver. Even if the dollar rises. Everyone’s extrapolating what happened in the past. That was the past. The market is at all times highs (and housing). Gold (relative to money printed) is below 1999 levels. Good points Jeff, but not everybody “forgets we already had the correction”. I’ve watched the gold and silver market, pretty much tick for tick, since December 2008. I just get tired of hearing that gold and silver are going to have yet one last big corrective movement down. Like Jeff Nielson over at “financialsurvivalnetwork.com”. Good grief!! Silver topped at the end of April 2011 just shy of $50 and bottomed in December 2015. 4 years, 8 months bear. Gold topped late August/early September 2011 at around $1,920 and was attacked after the Labor Day holiday. Also bottomed in December 2015. 4 years, 3 months bear. Both were brutal and I have the scares to prove it. According to this recent video from Israeli News Live (https://youtu.be/z_dSvKKo-vQ ), there have been HUGE (50MT) deliveries of gold from Switzerland to the USA in May ’16 – more than all combined shipments from 2000 until present. Some are speculating it is due to growing instability in Europe and the potential for a large scale war. Thanks for sharing this reminder Brandon. Very interesting! Please allow me to add an experience I just had this week. I was watching a programme on home renovation and this house that had burnt down in the past was being rebuilt, retaining the old still standing walls, but the end product was an amazing reed thatch storeyed house. The host of the programme ended with a paraphrase of these words, ‘A house epitomises human endeavours. Houses are built from design to completion through the sheer will of man’ And I took those word to heart as indeed they sounded right. If so then, that a house is the symbol of human effort and power, then James dream would refer to that effort and power of humans already being at jeoroardy and soon to fall and crash in its entirety. All human will that is contrary to wisdom and God’s way is soon to be done away with. Just adding my perspective, but as well appreciate other interpretations that have been presented. Now the mystery has been solved as to why nobody comes back to your place for a second visit……..
James, I had a dream early this year about a house market crash also. I draw custom house plans for a living and I have a builder that I have drawn for, for years and we have become very good friends. Well in my dream the housing market was so bad that my friend was selling watermelons on the side of the road and his cloths were wore out like it must have lasted a long time and his melons were not very good ones either in fact his brother came by and was making fun of his melons. The roof of a house then would epitomize the leadership of human endeavour and that too falling down and scattering the dust seconds that the leadership of the people also falls with the people, and gets scattered. How will a real estate collapse effect FAZ?